The Kvíárjökull, a southern outlet glacier of the Vatnajökull, is confined in the mountain foreland by lateral moraines measuring a height of up to 150 m. Each of the lateral moraines shows considerable breaches with deviations of the main moraine ridges. The paper discusses the possible origins of these modifications of the lateral moraines as result of: 1) ice overlappings during glacier advances and subsequent breaches of the lateral moraine, 2) bifurcations of the Kvíárjökull glacier tongue triggered by the preglacial relief conditions and the prehistorical moraine landscape leading to afflux conditions, 3) drainage of ice-marginal glacier lakes and 4. volcanic activities, such as lava flows and volcanic-induced jökulhlaups. A historic-genetic model of the formation of the lateral moraines is presented considering the breaches in the lateral moraines as result from glacier bifurcations and therefore as former tributary tongue basins. Such breaches in the lateral moraines are also common landscape features at glaciers outside of Iceland and are from wider importance for the paleoreconstruction of former glacier stages. 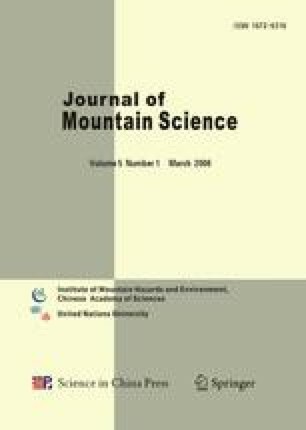 The knowledge of their development is essential for an adequate relative age classification of individual moraine ridges. In regard to the origin of the debris supply areas of the large-sized Kvíárjökull moraines, the resedimentation of prehistoric till deposits by younger glacier advances plays a role in the formation of the lateral moraines apart from englacial and supraglacial sediment transfer processes.